Meet Simon - new to the Refuge. 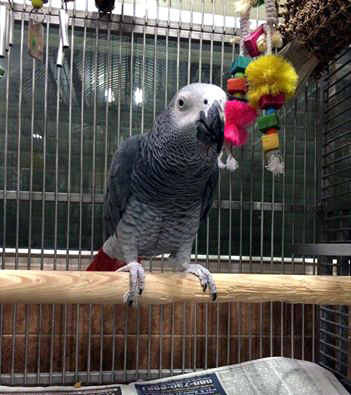 We are still learning about this Congo African Grey, so it will be awhile before he (we presume - might be a she) is available for adoption. But so far, Simon is adjusting well to his new environment. A good article on PBFD. Please read and keep this in mind. This is one of the reasons that Rich & Karen are so strict on making sure all boarders and turned-in parrots are current on disease testing. Please join us in welcoming our two newest members; Kaiya, a Grey Phase Screech Owl with a broken (and healed) wing and leg who is unreleaseable; and Peaches, an M2 who was returned to the Refuge after ten years in a loving home due to extreme allergies to her dust. We have both sad and happy events to share in this edition of the newsletter. We had to say goodbye to Coco (AKA Chicky), who passed away in May. She was such a sweetheart who will be missed by everyone. Although it remains a mystery as to what toxic item Coco actually ingested, it serves as a reminder to all that if you see something even remotely questionable in a bird’s cage, please remove it and bring it to Rich and/or Karen’s attention immediately. We’ve had two adoptions during the past month. Congrats to Professor and Vito, who’ve both found their forever homes! Vito was adopted by the same family who adopted Jackie and Professor went to a family that has other birds as well. We wish both Greys much happiness with their new families! Our first annual 10-Mile Walk to Support the Parrots was a HUGE success! Thanks to everyone’s participation, we were able to raise a shocking total of $7,200.00!!! Special thanks to Ryan C. for donating the great shirts for our walk! The Fundraiser Walk on 5/30/2011 was awesome! We came, we walked, we sweat and we had a lot of fun! Thanks for organizing this walk, Maryann, Erica and Ann and everybody else who was involved. We shall post some of the pictures shortly!